We describe a solid-phase extraction adsorbent based on molecularly imprinted polymers (MIPs), prepared with use of a mimic template. The MIPs were used for the selective extraction and determination of three chlorogenic acids as combined quality markers for Lonicera japonica and Lianhua qingwen granules. The morphologies and surface groups of the MIPs were assessed by scanning electron microscopy, Brunauer–Emmett–Teller surface area analysis, and Fourier transform infrared spectroscopy. The adsorption isotherms, kinetics, and selectivity of the MIPs were systematically compared with those of non-molecularly imprinted polymers. The MIPs showed high selectivity toward three structurally similar chlorogenic acids (chlorogenic acid, cryptochlorogenic acid, and neochlorogenic acid). A procedure using molecularly imprinted solid-phase extraction coupled with high-performance liquid chromatography was established for the determination of three chlorogenic acids from Lonicera japonica and Lianhua qingwen granules. The recoveries of the chlorogenic acids ranged from 93.1% to 101.4%. The limits of detection and limits of quantification for the three chlorogenic acids were 0.003 mg g−1 and 0.01 mg g−1, respectively. 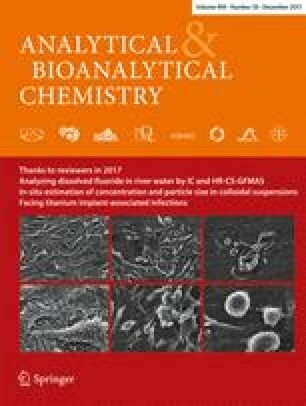 The newly developed method is thus a promising technique for the enrichment and determination of chlorogenic acids from herbal medicines. Mimic molecularly imprinted polymers for the selective extraction of chlorogenic acids. The online version of this article ( https://doi.org/10.1007/s00216-017-0667-1) contains supplementary material, which is available to authorized users. This research was supported by the National Natural Science Foundation of China (81473298, 81603286), the Key Science and Technology Program of Shandong (2014GSF119031), the Natural Science Foundation of Shandong (ZR2016YL006), the Shandong Province Taishan Scholar Program (Lanping Guo), and the Priority Research Program of the Shandong Academy of Sciences (Lanping Guo).